ü The Indian climate can be described as the tropical monsoon type. ü The monsoon climate is characterized by seasonal reversal of wind direction associated with alternating periods of rainfall and drought. ü The Indian climate is greatly influenced by the presence of the Himalayas in the North and the Indian Ocean in the South. ü The Tropic of Cancer divides India into two almost equal climatic zones. ü The Southern tropical climatic zone of India is warmer than the north and does not have a clear - cut winter season. ü The seasons can be classified into four groups. ü The retreating South - West monsoon season (from October and November). ü During the cold dry season, the mean temperature is about 240C to 250C in southern India and about 100C to 150C in the plains of the North. ü January is the coldest month. 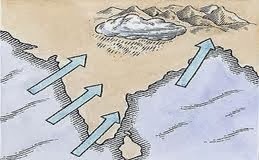 ü The North-East monsoons rain only in coastal Tamil Nadu where the winds become moist after absorbing humidity from the Bay of Bengal. ü Eastward bound cyclones from the Mediterranean Sea may bring scanty rainfall in the North - Western parts of the Ganga plain. ü There are only two regions which receive rainfall in the winter season in India. The north western part of the Great Plains, and the Coromandel Coast. ü The north - eastern area, including West Bengal, experiences thunderstorms called kalbaishaki. ü Kerala and the western coastal parts witness pre - monsoon showers. ü Pre - monsoon showers are a common phenomenon in Kerala and coastal areas of Karnataka towards the end of summer. ü They are locally known as mango showers since they help in early ripening of mangoes. ü The south - west monsoon season is the season of general rainfall. ü In early June, the winds from the Indian Ocean begin to blow towards the great low pressure centre in the north - western part of India. ü These are the south - west monsoons which blow from June to September. ü The Arabian Sea branch of the monsoon is obstructed by the Western Ghats. Heavy rains occur in the windward side of the Sahyadris. ü The South - West monsoon starts retreating from northern India in early October. 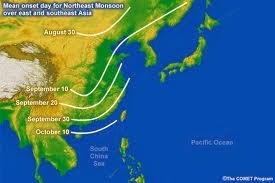 ü Hence, the months of October and November are known for the retreating monsoons. ü The low pressure conditions are transferred to the centre of Bay of Bengal by early November and this shift of the low pressure area is marked by cyclonic depressions which originate over the Andaman Sea.